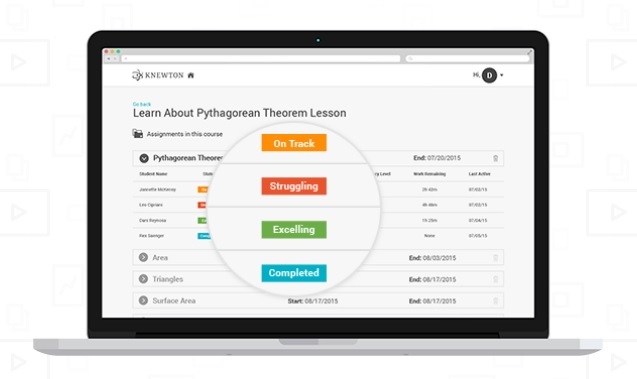 Knewton is a free online learning site that lets teachers create virtual classrooms and monitor students work. Yes, there are plenty of other sites that let you do the same thing (see The Best Sites That Students Can Use Independently And Let Teachers Check On Progress). the platform presents video and a variety of written content and then asks multiple-choice questions. Based on student responses, and patterns of responses from other similar students, the next piece of content is served up. It offers English, math and biology courses. Sign-up and student registration is easy. I’m going to have a few students try-out the fourth-grade English course today to see what they think. It definitely seems pretty hard to me – beyond what I would expect of a fourth-grader. We’ll see what my English Language Learner students have to say about it. Knewton may or may not be a useful supplement. I suspect, though, that it’s not going to be the “magic pill” its finder claims it that it will be. You can read more about it at that NPR article, headlined Meet The Mind-Reading Robo Tutor In The Sky. I’m still going to add this post to the previously-mentioned “Best” list, as well as to The Best MATH Sites That Students Can Use Independently And Let Teachers Check On Progress.